Quarterly and 2015 Fundraising Totals Represent Records for Wisconsin, Over 25,000 Wisconsinites Have Contributed to Russ for Wisconsin. MIDDLETON - Russ for Wisconsin announced today that the campaign has raised nearly $2.7 million in the fourth quarter and over $7.4 million since Russ jumped into the Wisconsin senate race less than 8 months ago. Both figures represent federal off-year records for Wisconsin and demonstrate Russ’ strong start as the election year gets underway. Broad grassroots support continues to serve as the backbone of Russ’s campaign. Over 25,000 Wisconsinites have contributed to Russ’ bid for the U.S. Senate. Russ’ contributors hail from all 72 of Wisconsin’s counties. 94% of all Q4 contributions are under $100. 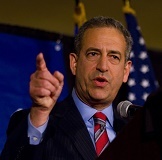 "I’m honored to stand with the tens of thousands of Wisconsinites who have contributed their time and their resources into building this campaign," Feingold said. "I’m proud of our campaign’s strong grassroots support. The people of Wisconsin are making it clear that they want leaders who will fight for middle class and working families – not just a select few. I'm extremely grateful to have their backing and their confidence."